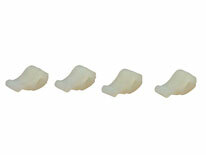 ERP Replacement Agitator Dogs used on some Whirlpool, Estate, Kenmore, KitchenAid and Roper brand washing machine models. 80040, AP3119063, 285612, 285770, 3109, 3366877, 387091, AH388034, EA388034, PS388034. Agitator dogs are 4 small plastic pieces that are located under the agitator cap that grip the agitator and turn it during the cycle.